Housed in a wall-mount, watertight plastic enclosure, the CN1511 is a flexible temperature controller that offers the ease of an on/off controller with the precision of a full-blown PID controller. For applications that do not require the complexity of PID control, this device can be programmed to work as simple on/off controller. Yet for processes that require close temperature conformity, the CN1511 can be run under full PID control, selectable for either heating (direct acting) or cooling (reverse acting). The CN1511 accepts 5 different ramp and soak programs, each with up to 10 segments. Separate pass-codes are required for selecting or entering a ramp/soak program. This prevents operators from making any inadvertent changes. The manual hold feature allows for an indefinite hold anywhere along the ramp/soak profile. Also offered is a manual setpoint entry mode for a quick ramp-to-setpoint function. This eliminates the need to enter a complete ramp/soak program. 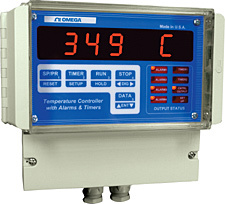 Maximum and minimum temperature readings are continuously tracked, and 4 optional process alarms are available. These are programmable over the entire range of the selected input type. They can be configured as latching or non-latching, normally open, or normally closed. There are also 2 optional timers that work independently or in conjunction with process limits (e.g., turning on a fan 10 minutes after limit 1 temperature is reached). The time function keeps track of process run time. The CN1511 also functions as a rate monitor, indicating instantaneous as well as average rate of temperature change. A programmable time base allows the rate to be displayed in per second, minute, hour, or any other interval. The CN1511 can also be programmed for a rate alarm, which can indicate whether a predetermined rate is exceeded or not achieved. Additional features include a built-in buzzer that sounds whenever a limit is reached (available with the relay option). Visual indication of relay output status is given by LEDs on the front panel. The CN1511 also has a power line filter, designed to provide trouble-free operation in harsh industrial environments.